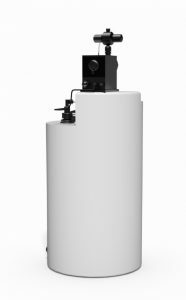 Water Control recommends whole-building (point-of-entry) High-Capacity Ultrafiltration as a “firewall” to prevent new microorganisms and new nutrients from entering a building’s plumbing system. Often, this will greatly increase municipality-provided disinfectant’s efficacy, to the point where no additional treatment is needed to control waterborne pathogen levels (including those of Legionella pneumophilia). In certain situations however (and for various reasons), disinfectant residuals provided by the city are simply inadequate. When this occurs, supplemental disinfectant injection may be required on-site. Water Control has the knowledge, and the equipment, to provide for the injection of free-chlorine (sodium hypochlorite), chlorine dioxide, and monochloramine. The preferred method is monochloramine, due to its ability to penetrate biofilms and provide a longer-lasting residual. In some cases, free chlorine from the municipality can be transformed into monochloramine via an ammonium chloride injection. Our injection systems feature fixed and variable speed pumping, BAS connectability, residual concentration monitoring, and chemical replenishment programs (monochloramine only). Need help with a disinfectant residual application?